As the cold weather draws in, this curry is a great comfort food. Sweet potatoes are packed full of nutrients, they are an excellent sources of beta-carotene, Vitamin C, manganese, iron and Vitamin B6 to name but a few. Vitamin C is fantastic for boosting the immune system, which is ideal as the colder weather sets in. Sweet potatoes also contain iron which helps to boost energy levels and as a slow release carbohydrate they help to maintain blood sugar levels and keep you feeling full for longer. This recipe is so easy to make. One of the great things about it is you can leave the chicken to marinate in advance or if you don’t have time you can just leave it to marinate whilst you prepare the rest of the dish. Smoked paprika is made from a combination of dried sweet peppers and dried chilli peppers, the colour varies depending on the type of peppers used. Paprika is rich in Vitamin C and carotenoids, it is rich in beta-carotene which is converted into Vitamin A in the body which plays a vital role in maintaining healthy skin, preventing wrinkles and promoting a brighter complexion. Paprika contains high levels of iron; 1 tsp contains 6% of men’s and 3% of women’s recommended daily intake of iron. This recipe is a great way to make the most of seasonal ingredients. The addition of wild garlic leaves gives it a great colour and flavour; however it works just as well with a garlic clove. This dairy-free pesto works well with both pasta and salmon. Put the nuts and garlic into a hand blender and blend until they are roughly chopped. Add all the other ingredients except the olive oil and blend. Add a little bit of olive oil at a time so that there is just enough to make a paste consistency. Optional extra: add a couple of tbsp. of tomato puree to make a tomato pesto, great on pizzas! One of my favourite dishes when I go to a Vietnamese restaurant is Pho is a hearty, healthy broth packed full of delicious ingredients. This is my take on a prawn pho, the prawns can easily be replaced with chicken or tofu if you prefer. If I make it with chicken I use homemade chicken stock to add extra goodness. This recipe uses cloves which are often an ingredient that get bought for a particular recipe, like ham at Christmas, and then sit in the cupboard for the rest of the year. However there are many health benefits to cloves they have anti-fungal, antibacterial, antiseptic and analgesic properties. Due to these properties they are commonly used in Ayurvedic medicine. NB if you don’t have muslin you can place the spices directly in the pan and simmer for at least 10 minutes and then strained the stock before adding the remaining ingredients. I love this dish, it is so quick and easy to do when you get in from work and it is packed full of omega 3 fatty acids which are essential to your overall health. Omega 3 and Omega 6 are two types of fat that are essential for human health, the body cannot create them, and we must consume them. However, most people don’t consume enough omega 3 and too much omega 6, the ideal ratio is 1:1 of omega 6:omega 3 research shows that many people consume a ratio of between 20:1 and 50:1. Eating enough omega 3 has been linked to helping prevent or ease symptoms of the following health conditions: coronary heart disease and stroke, essential fatty acid deficiency in unborn babies (retinal and brain development), lupus, nephropathy, osteoporosis, cancer, Crohn’s disease and rheumatoid arthritis. In addition to this Omega 3 can support general brain health including memory loss and osteoporosis. This week I’m in Norway staying with a lovely yoga teacher called Vild from Allmenningen Yoga. Last night we made polenta bread and served it with a homemade ratatouille. Polenta bread isn’t the texture or taste of normal bread so you wouldn’t have it with jam but it is great with soup or main meals. Polenta dates back to the 1700s in Italy where it was a staple food which was very cheap. 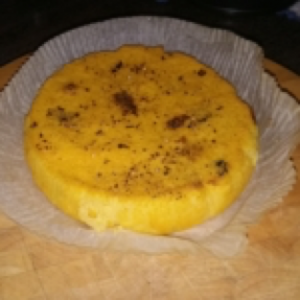 Polenta is made from corn which means it is a low carbohydrate food rich in Vitamins A and C, it is a good source of caroteinoids, lutein and zeaxanthin. Therefore it can help to prevent cancer and heart disease. Polenta is gluten-free. This curry came about when I realised I didn’t have the spices I needed for my usual curry so I thought I’d experiment a bit. It’s a great one if you don’t have much time, you can throw it together and then leave it to cook whilst the rice cooks. 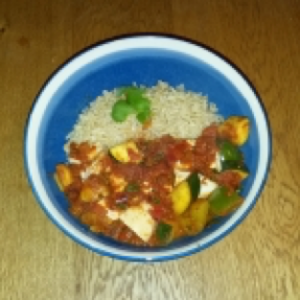 The heat from the chilli makes it a lovely dish to warm you up as the colder evenings draw in. If you’d like to make a vegetarian version simply swap the chicken for chickpeas. Tomatoes are a fantastic source of Vitamin C as well as lypocene. Lypocene is part of the cartenoid group of antioxidants. Lypocene can help to prevent and treat a number of conditions including cancer, diabetes, cataracts, osteoporosis and heart disease.